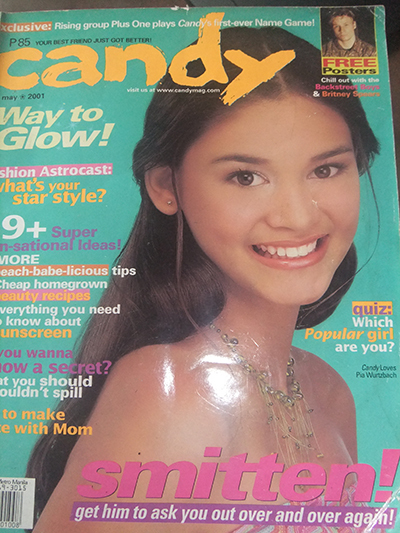 Look who I found at the cover of Candy magazine (May 2001 issue). It’s Binibining Pilpinas 2013 First Runner up Pia Wurtzbach. This stunner was only 11 when this mag cover was published. Isn’t she a looker even at a young age? This entry was posted in Personality and tagged beauty queen, binibining pilipinas 2013, candy magazine, first runner binibining pilipinas 2013, magazine cover, pia wurtzbach, runner-up on April 21, 2013 by Mommy Yam. Hello Veronica. I think I lost this magazine already. 🙁 But will still try to look for it. Thanks!